I discovered an excellent new (to me) writer a couple of weeks ago — though I have to admit her name is so familiar, I keep thinking we must have met somewhere in the labyrinth of the writer’s world: a conference, workshop, or publisher event. Somehow, and I don’t remember that either, a copy of Stillhouse Lake showed up on my eReader. No, I don’t think it was magic; it was probably a promotion of some kind where I downloaded the book and then promptly forgot about it. Well . . . for some reason, I started reading it despite the fact I was already in the middle of two books and an audio book. 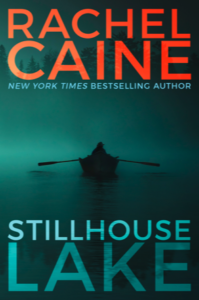 Let me tell you, I was hooked from the very beginning and the two other books, that were good, got put on hold until I finished Stillhouse Lake. This is such a well written, tightly plotted book with compelling characters. It really is one of the best suspense novels I’ve read this year. I highly recommend it. Oh, and I’ve already preordered the second book in the series (Killman Creek) which comes out on December 14th. I can’t wait! So, after you read it, let me know what you think in the comments section below. P.S. I’m pretty sure both books are only available through Amazon. Here is the link, or click on the cover or text links above. I just downloaded this, at the nest in the series, Killman Creek. I’m bummed I missed getting these on Netgalley! The t third in the series releases next October so ii anticipate aa reread before then. This series sounds exciting!! Thanks for the recommendation. It’s really good. I was kind of blown away that I’d never read any of her books before. If you look at her website, she’s been around a while. Anyway, let me know what you think when you finish. Check out my latest book review. The Art of Inheriting Secrets by Barbara O'Neal. "Most people have their favorite comfort foods. I have comfort “authors” and Barbara O'Neal / Barbara Samuels is one of them. Patricia Keelyn shared a post. A moving box set! Three Texas brothers — a Hollywood hero, a Special Forces medic, and an FBI agent — will do whatever it takes to protect the women they love.